The 'ultra-cool' new slot Cool Jewels is a fresh take on traditional slot machines. It's what would happen if Bejeweled, Candy Crush Saga and a slot machine were to mate and have an incredibly fun baby. The ‘ultra-cool’ new slot Cool Jewels is a fresh take on traditional slot machines. It’s what would happen if Bejeweled, Candy Crush Saga and a slot machine were to mate and have an incredibly fun baby. 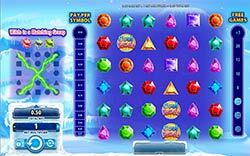 Cool Jewels slot game does not use paylines, but All symbols appear on a 6×6 grid. Nonetheless, the symbols on the reels are displayed in the same manner as they do on most video slots. Payline numbers are replaced with meters that appear on the sides. The left meter shows the pay per symbol while the right one shows the number of Free Spins available. The total bets run from 0.50 coins all the way up to 200 coins therefore making this game great for a wide variety of budgets and also gives you full control of your bets.